As the daughter of a World War II Army Air Corps veteran, honoring those who have served our nation has been important to me. This year marked the 100th anniversary of the signing of the Armistice that ended World War I; the day would later be recognized as Veterans Day. 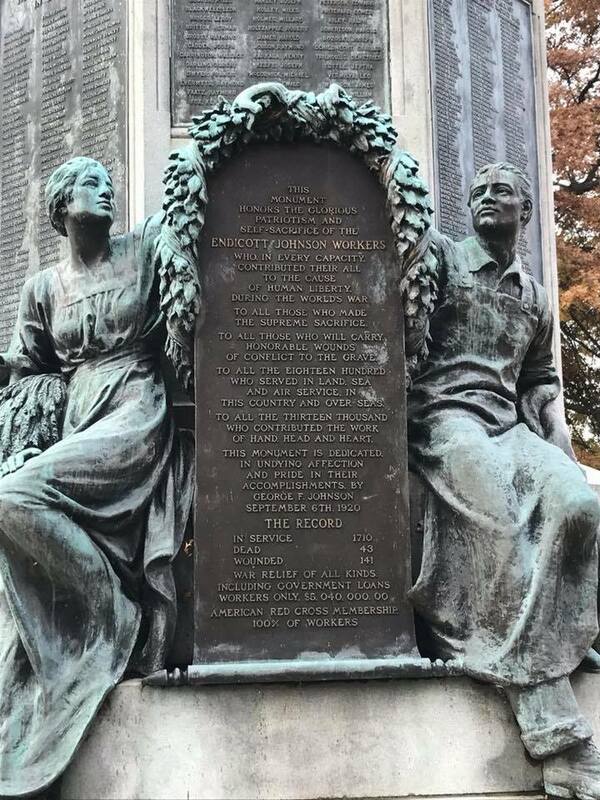 On November 11th, I spent time at the Endicott Veterans Day Memorial Service and Binghamton’s Veterans Day Parade; Endicott has a beautiful monument dedicated to Endicott-Johnson workers who served in WWI. Endicott’s monument dedicated to Endicott-Johnson workers who served in WWI. Ensuring that we have resources and services to help newer veterans as they return to civilian life is an ongoing priority for me. I’m working on policies to assist former servicemen and women with employment; new opportunities are emerging as our manufacturing, high-tech, and agriculture industries are expanding. The state is also committed to awarding more contracts to veterans; learn more about the NYS Office of General Services’ Division of Service-Disabled Veterans’ Business Development by clicking here. After years of neglect, the former Endicott-Johnson factory at 1 N. Page Ave. in Endicott is gone. On November 5th, I joined County Executive Jason Garnar and residents from the community to watch as the demolition started. The site will become the new corporate headquarters for National Pipe and Plastics. While some of our historic industrial buildings have been renovated and given new life, unfortunately, this particular factory was too far gone to save. 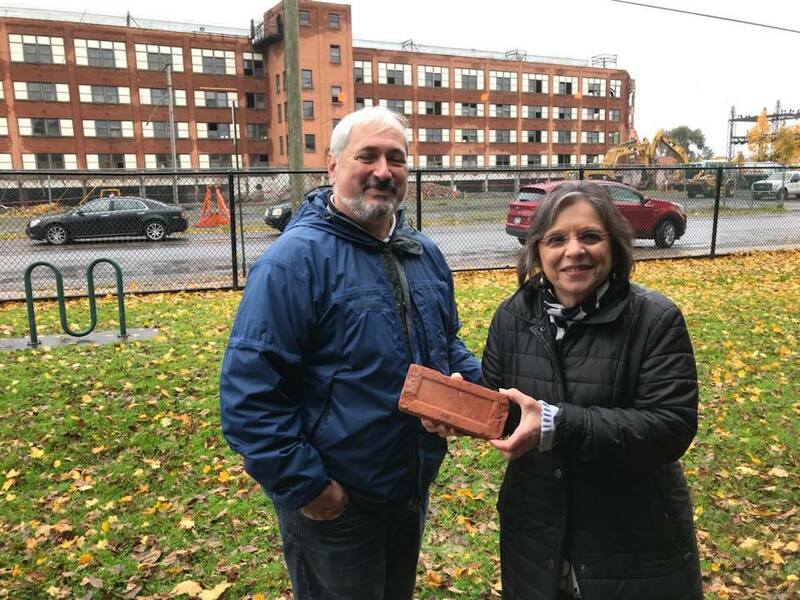 Bricks from the building were given out to the public as mementos; as a tribute to the site’s legacy in our community, a plaque dedicated to the EJ factory will be installed using some of these bricks. Assemblywoman Lupardo displays a brick from 1 N. Page Avenue with Town of Union Supervisor-Elect Rick Materese. The day after Thanksgiving unofficially ushers in the holiday shopping season. Small Business Saturday has become a focal point encouraging shoppers to buy local. On November 24th, I stopped by the Broome County Regional Farmers Market to support some of our local producers. 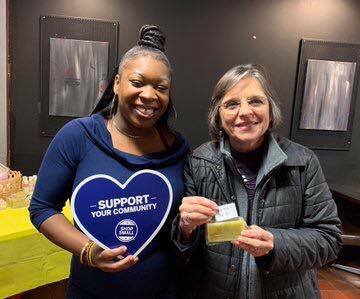 Additionally, the Binghamton Community Advocates Project (BCAP) hosted a Pop-Up Shop in Binghamton. BCAP is one of the programs that was created out of our local anti-poverty initiative and centers around residents creating their own plans for economic success. Several women from the program have started their own businesses and showcased them at the Pop-Up Shop. It was great to get to meet some of our community’s newest entrepreneurs. Assemblywoman Lupardo at the BCAP Pop-Up Shop on Small Business Saturday. With the new legislative session a little over a month away, I’ve been busy preparing for our return to the Capitol. As Chair of the Assembly Committee on Aging, issues that affect seniors across the state are among my top priorities. On November 14th, I led a hearing in Albany on healthy aging focused on helping seniors maintain their quality of life. According to AARP, 87% of adults over the age of 65 want to stay in their current home and community as they age. 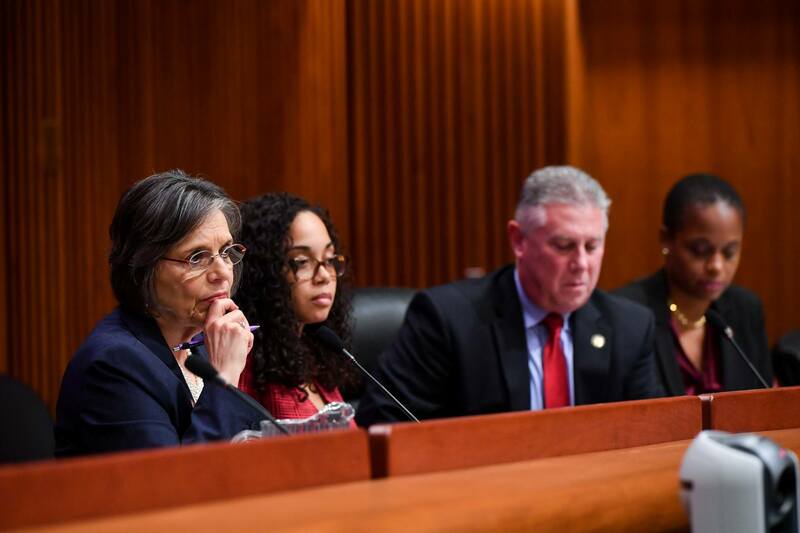 Witnesses at the hearing shared their expertise about current programs and services, and assessed the challenges older New Yorkers face when trying to remain in their homes. Additionally, we looked at best practices and heard some new ideas worth pursuing. This hearing will help me and my colleagues as we enter into budget discussions and look at new policies in 2019. Click here to watch a video of the hearing. Assemblywoman Lupardo listens to testimony during a hearing on healthy aging. The holiday season returned to Endicott last weekend with a two-day celebration on Washington Avenue. On Friday, hundreds of people enjoyed live entertainment, food, and family-fun activities at the second annual Holiday Magic on the Avenue. We began the evening with a street lighting and finished it off with a wonderful fireworks show in downtown Endicott. In between, visitors had the chance to see Santa Claus, decorate cookies with Mrs. Claus at Phantom Chef, enjoy live music, take a ride on the BC Transit Trolley to the Christmas Market at George W. Johnson Park, and even make 3-D printed snowflakes. I was proud to be a sponsor of this event that helps showcase the wonderful businesses and activities on the Avenue. The following day, the 79th Endicott Holiday Parade featured floats, marching bands, and community groups. Thank you to everyone who came out to support these great events! 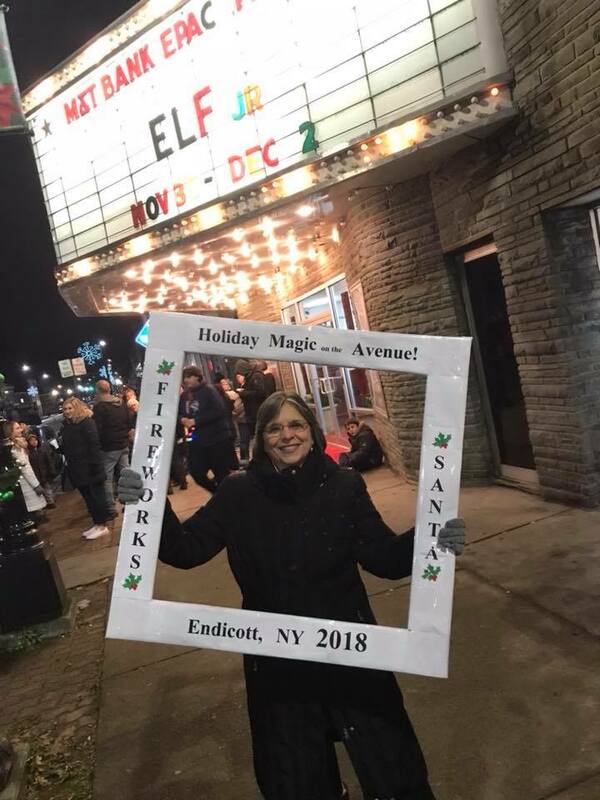 Assemblywoman Lupardo at the second annual Holiday Magic on the Avenue.